Baku, the city of winds and the pearl of the Caspian Sea, and Rio de Janeiro, the magnificent city of festivals became twin cities. Mayor of Rio de Janeiro Eduardo Paes signed a law to make Azerbaijani capital Baku and Rio de Janeiro twin cities. The law was adopted on November 6 by the Foreign Relations Committee of Rio de Janeiro City Council, Azerbaijani Embassy in Brazil said. The law that came into force on December 4 says Baku and Rio de Janeiro, the second largest city of Brazil, have a lot in common. Both cities regularly host cultural events, and the law said there are a dynamic lifestyle, rich history, grandiose architecture, and love for sports in Baku. The law goes on to say Baku and Rio de Janeiro are known as the cultural heritage centers of the world and are visited by thousands of tourists every year. Baku`s candidacy as a host for important international events in future will give an impetus to the development of dialogue and exchange of experience between the two cities. Baku is the capital and largest city of Azerbaijan, as well as the largest city on the Caspian Sea and the Caucasus region. Located 28 meters below sea level, Baku is the lowest lying national capital in the world. The city is also the largest city in the world located below sea level. Considered the scientific, cultural, and industrial center of Azerbaijan, Baku hosted the 57th Eurovision Song Contest in 2012 and will host the 2015 European Games. Baku's twin city Rio de Janeiro is the third largest metropolitan area in South America, boasting approximately 6.3 million people within the city proper, making it the 6th largest in the Americas, and 26th in the world. Part of the city, founded by the Portuguese, has been designated as a World Heritage Site, named "Rio de Janeiro: Carioca Landscapes between the Mountain and the Sea", identified by UNESCO on 1 July 2012 in the category Cultural Landscape. Rio de Janeiro is one of the most visited cities in the southern hemisphere and is known for its natural settings, carnival celebrations, samba, Bossa Nova, and balneario beaches such as Barra da Tijuca, Copacabana, Ipanema, and Leblon. 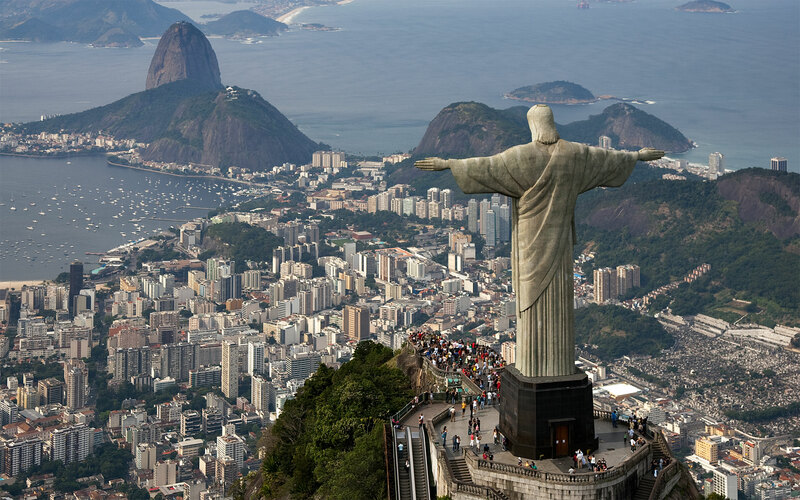 The giant statue of Christ the Redeemer ("Cristo Redentor") atop Corcovado Mountain in the city was named one of the New Seven Wonders of the World. Diplomatic relations between Azerbaijan and Brazil were established in 1993. Brazilian Embassy in Azerbaijan was opened in June 2009. Azerbaijan's Embassy was established in Brazil in 2012.